Three variations of Flourless Almond Cookies: Vanilla Cinnamon Cardamom, Chocolate Thumbprint and Orange Vanilla Chocolate Chip. All are dairy-free, gluten-free and delicious! When I tell you why I love these cookies so much you, maybe you’ll start making them obsessively too. First and foremost they’re delicious – a little sweet but not overly – nicely textured with a bit of crunch on the outside, chewy and tender inside. 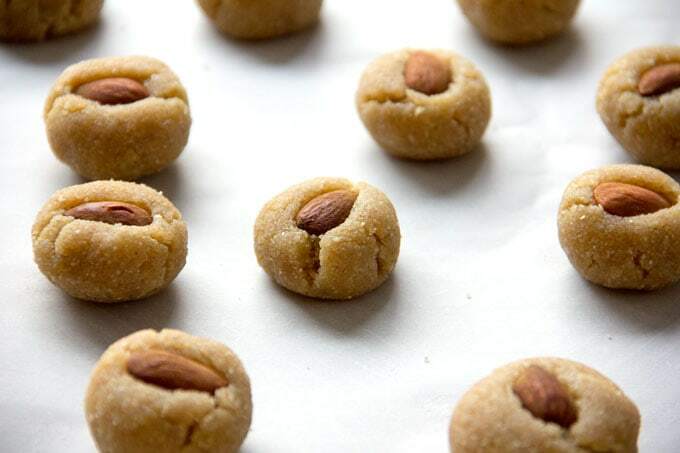 Also, they’re healthier than most cookies because they’re made from mostly ground up almonds – no wheat flour, no butter or oil, and no dairy. Just a small amount of sugar – 1/2 cup per batch. I’m not gluten intolerant but I prefer to eat things that have nutritional value over things that don’t. I have none of the usual cookie guilt (“I really shouldn’t…I’d better just have one…”) when I eat these. 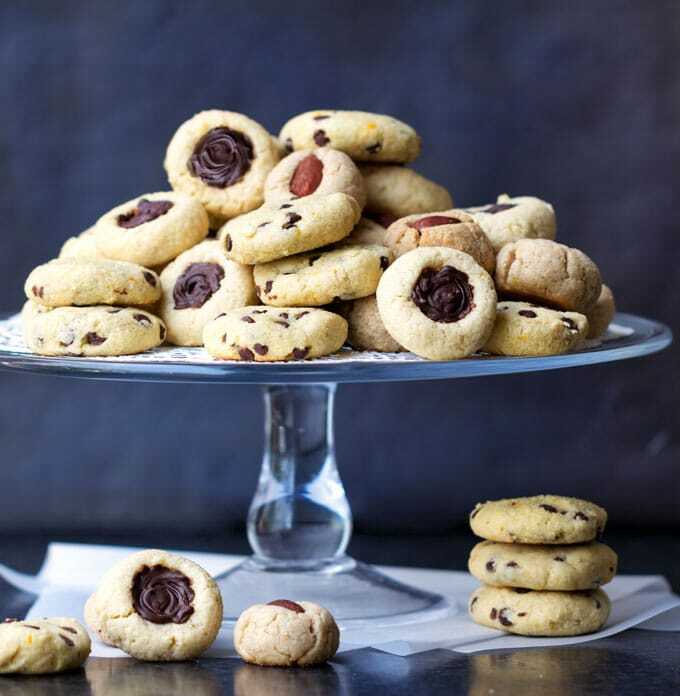 Another virtue of these cookies is how unbelievably quick and easy they are to make. Stir everything up in a bowl, shape, and bake for 16 minutes. It’s likely that you’ll have them all mixed and set on your baking tray and you’ll be tapping your foot waiting for the oven to preheat. My first foray into baking almond cookies was two years ago when I posted a recipe for Spanish almond cookies. Spain is one of the worlds largest almond producing countries and desserts made with almond flour are common. Almond flour is simply blanched almonds, with the brown skin removed, that are finely ground. You can also find almond flour that includes the brown skin. That will work just as well in these cookies only you’ll get a more rustic looking cookie. I strongly encourage you to experiment with other variations of these cookies. They’re very adaptable. 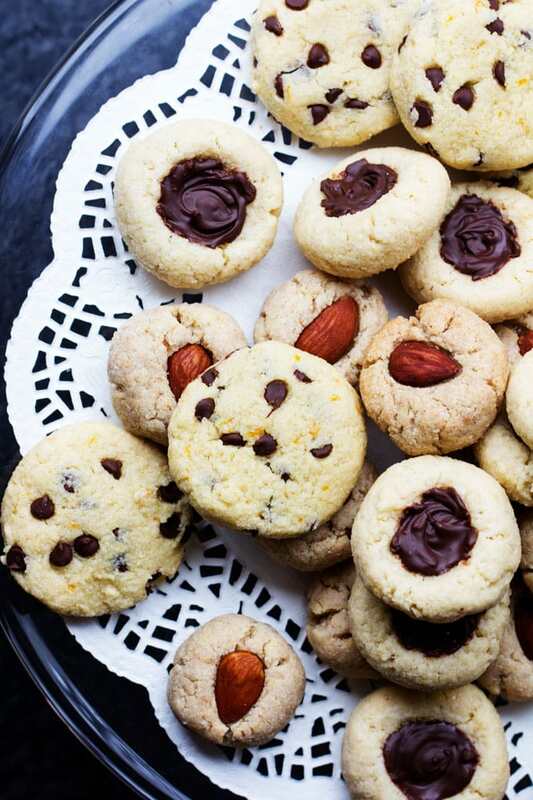 My friend Nina caught my almond-cookie obsession from hearing me go on and on about them and she’s tried them with lemon zest, orange zest, ground ginger, and jam hearts for valentine’s day – every batch got raves. Here are the recipes. Please come back and leave a comment if you make them. Let me know which ones you tried and how you like them. If you come up with another delicious version I’d love to hear about it! If you post a photo of your cookies on Instagram, be sure to hashtag it #PANNINGTHEGLOBE. I’d love to see your cookies! Vanilla cinnamon almond cookies with a hint of cardamom and an almond on top. In a large bowl combine all dry ingredients: flour, sugar, cinnamon, cardamom and salt. Add egg and vanilla and stir to combine. Knead with your hands to fully combine. Make 18-20 dough balls using a generous tablespoon of dough at a time. Squeeze it and roll it. Spread balls out evenly on prepared baking sheet. 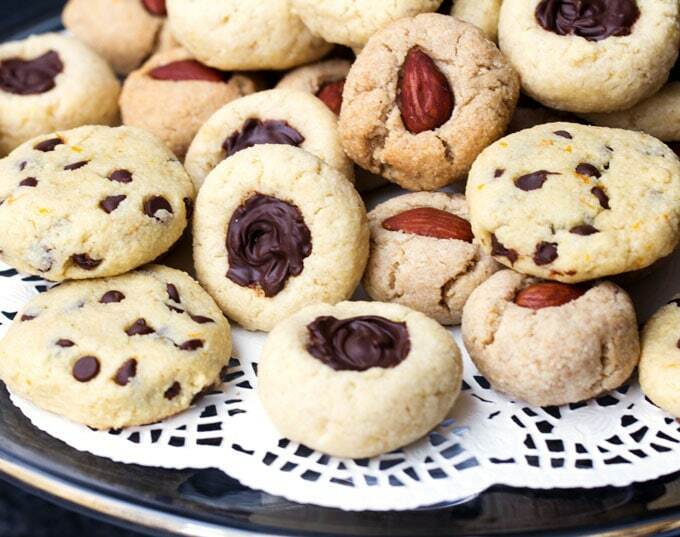 Press a whole roasted almond down into each cookie. Bake in the center of the oven for 16 minutes. Cool cookies on pan for 5 minutes. Transfer cookies to wire rack to cool completely. Store in an airtight container for up to 3 days. Delicious vanilla almond chocolate chip cookies with a hint of orange. Mix all the dry ingredients together in a large bowl: flour, sugar, orange zest and salt. Stir in eggs and vanilla. Knead with your hands a bit to fully incorporate everything. Add chocolate chips and knead a bit more, until the chocolate is mixed in evenly. 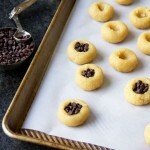 Shape the Cookies: Grab about 1 1/2 tablespoons of dough in your hands and roll it into a ball. Flatten it in your hand and place it on the prepared tray. Repeat with the rest of the dough, spacing the cookies about 1/2 inch apart. If your hands get sticky, rinsing them in icy cold water should help keep the dough from sticking to you. Bake in the center of the oven for 16 minutes. Cool cookies on pan for 10 minutes. Transfer cookies to wire rack to cool completely (about an hour for the chocolate to firm up) Store in an airtight container for up to 3 days. In a large bowl combine all dry ingredients: flour, sugar and salt. Add eggs and vanilla and stir to combine. Knead a bit with your hands until you get the consistency of sticky dough. Grab about 1 1/2 tablespoons of dough in your hand. Roll and squeeze it into a ball. 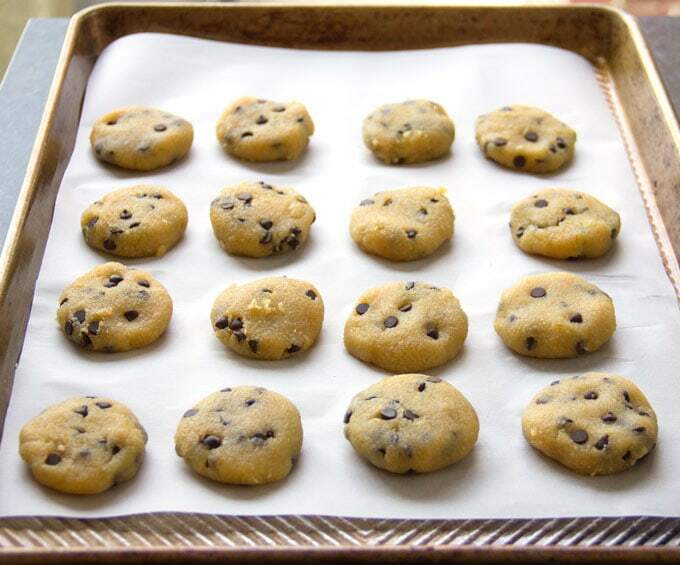 Make a hole with your thumb and place it on the prepared baking sheet. Pat it down a bit so the bottom is flat. Repeat with remaining dough. 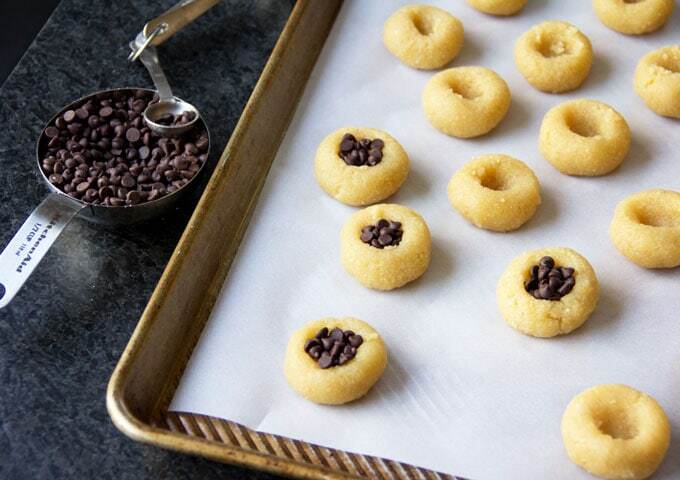 Pour about 1/4 teaspoon of mini chocolate chips into each hole – as many as you can fit in there. Push them down gently so you can pack lots of them in. Then add some more on top. Bake in the middle of the oven for 16 minutes. Remove and set tray on a heat-proof surface. Go to the next step quickly – while the cookies are hot. The chocolate centers will still be in the form of mini chips. 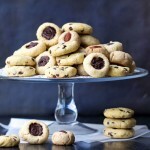 Take a pointy knife and use the tip to gently swirl the hot chocolate chips in the center of each cookie. Let the cookies cool on the tray for 10 minutes or so. Transfer to a wire rack to cool completely (about an hour for the chocolate to harden) Store in an airtight container for up to 3 days. What a scrumptious array of cookies! Almond flour has such a wonderful texture and flavor. This trio would make my family very happy! Acanthus these be frozen? I have to bake a Passover dessert this week. Sam, I haven’t tried freezing them so I can’t say with absolute certainty that they will be as perfect after freezing as they are fresh. If you can make them closer to Passover, they do keep well for a few days in the fridge. 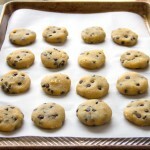 If you do make them early and freeze them, check out this great article from the Kitchn all about freezing cookies and the best practices: http://www.thekitchn.com/the-best-cookies-to-freeze-and-how-to-do-it-tips-from-the-kitchn-213638 If you do freeze them, I would love to know how they hold up. Did you ever receive a reply about freezing these cookies? Gorgeous cookies Lisa. Have been experimenting with almond flour in my kitchen too. Great flavor and texture. Love them all – especially those orange and vanilla flavoured cookies. Craving a cookie now! How beautiful are these cookies? And the selection is real! I want 4 of each! These look so good and I LOVE the photos too! These are going to perfect for Passover! I get so tired of stuff with matzo meal and matzo cake meal isn’t much better. (OK, end of rant:) I love the way these look and I’ll bet they are amazing. Every combo is amazing! And so easy and quick to make. Hi Lisa, just found your blog through Robyn’s. Your cookies look the perfect size and very delicious. Like the idea that they are so versatile.